With over 3,000 years of history, Israel’s largest city and the spiritual centre of the Jewish, Muslim and Christian religions, Jerusalem is a truly unique destination. Nestled in the Judean Hills on the edge of the desert, for centuries the so-called Golden City has stood as the most worshipped, fought-over and loved city in the world. Its different inhabitants have given Jerusalem a cultural and religious make-up like nowhere else on the planet. Defying the ravages of conflict, invading armies and the passing of centuries, Jerusalem’s architecture is remarkably well preserved. Visitors first get to know the fabled Old City enclosing within its eight magnificent gates and walls a living museum of religious buildings, busy markets, cobbled alleys and diverse faiths. Within the grand 16th-century ramparts are four quarters dating back to the major communities living here in the 19th century: Armenian, Christian, Jewish and Muslim. Each quarter has its sights and sensations. One minute you’ll be idling in a tranquil Armenian garden; the next, lost in the bustle of an Arab souk. The Western Wall at the foot of the Temple Mount is all that survives of the Jewish Temple and remains Judaism's most holy place. For Orthodox and Catholic Christians, the Church of the Holy Sepulchre is believed to enclose the sites of Jesus’ Crucifixion and burial. The beautiful gilded Dome of the Rock on the Temple Mount is one of the oldest Islamic works of architecture. 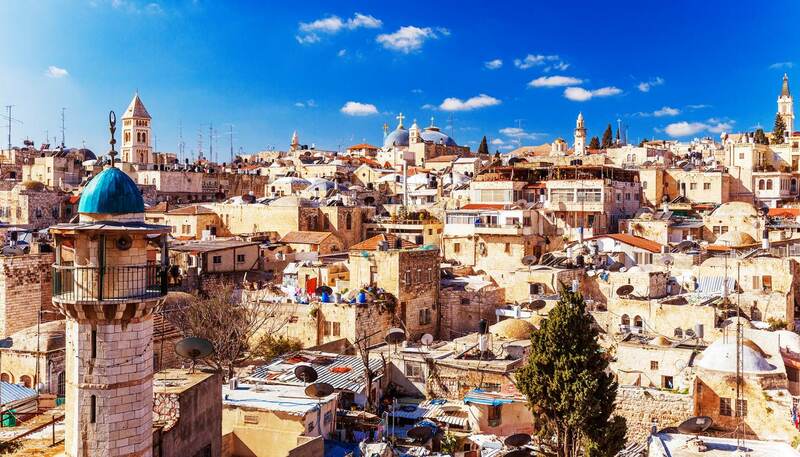 Predominantly Arab, East Jerusalem is a 19th-century neighbourhood lying north of the Old City with busy street markets, food stalls and cafes. To the east of this area is the Mount of Olives, with its large Jewish cemetery and the Garden of Gethsemane, where Jesus is said to have prayed the night before his crucifixion. Although Jerusalem is one of the world’s most historic cities, this doesn’t mean it’s stuck in the past. Beyond the Old City, the centre of Jerusalem is characterised by broad avenues, busy pedestrian streets, squares, cafés, restaurants and a vivacious nightlife. Large government buildings stand within manicured lawns, while the world-class university sits atop Mount Scopus with views over the Judean Mountains. For all Jerusalem’s contention and problems, life here goes on. With its temperate Middle-Eastern climate, extraordinary historical sites and world-class museums, it remains a compelling destination steeped in contrasts between ancient and contemporary, east and west.